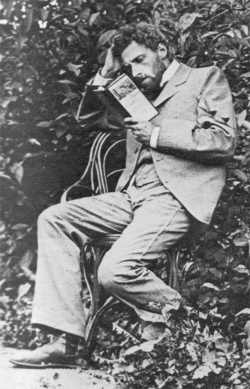 Meyerhold prepares for his role as Konstantin in the MAT production of Anton Chekhov's The Seagull, Pushkino, 1898. Vsevolod Meyerhold (Всеволод Эмильевич Мейерхольд, 1874–1940) was a Russian and Soviet theatre director, actor and theatre producer. The following passage is sourced from Andrey Smirnov, Sound in Z: Experiments in Sound and Electronic Music in Early 20th-century Russia, London, 2013, p 117. The Russian Revolution of 1917 made Meyerhold one of the most enthusiastic activists of the new Soviet Theatre. He founded his own theatre in 1922, which was known as The Meyerhold Theatre and lasted until 1938. Meyerhold fiercely confronted the principles of theatrical academism, claiming that they were incapable of finding a common language that could reflect the new reality. The actors participating in Meyerhold's productions acted according to the principles of biomechanics, a system of actor training that was later taught in a special school created by Meyerhold. Meyerhold connected psychological and physiological processes and focused on learning gestures and movements as a way of expressing emotion outwardly. He developed a number of body expressions that his actors would use to portray specific emotions and characters. Meyerhold was strongly opposed to socialist realism, and at the beginning of the 1930s, when Stalin was clamping down on all avant-garde art and experimentation, his works were proclaimed antagonistic and alien to the Soviet people. His theatre was closed down in January 1938. In 1939, Meyerhold was arrested and accused of anti-government political activities. Sentenced to death by firing squad on 1 February 1940, he was executed the next day. Scene from Vladimir Mayakovsky's The Bath, directed by Meyerhold. Scene from Émile Verhaeren's The Dawn, directed by Meyerhold, 1920. Scene from Sergei Tretyakov's The Earth in Turmoil, produced by Meyerhold, 1923. Scene from Nikolai Gogol's The Inspector General [Ревизор], directed by Meyerhold, 1928. Poster for the premiere of The Magnanimous Cuckold, 25 Apr 1922. Poster with a model of Popova's stage set for The Magnanimous Cuckold [Великодушный рогоносец] in the Meyerhold Theatre, Moscow, 1922. 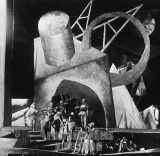 Model of Popova's stage set for The Magnanimous Cuckold, 1922. Scene from Fernand Crommelynck's The Magnanimous Cuckold, directed by Meyerhold, Moscow, 1922. 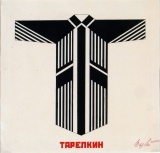 Poster for the premiere of Tarelkin's Death [Смерть Тарелкина], 24 Nov 1922, by Stepanova. Stepanova's set for Tarelkin's Death, 1922. Scene from Tarelkin's Death directed by Meyerhold, Moscow, 1922. 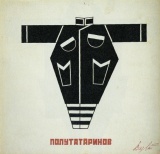 Stepanova's costume design for Tarelkin's Death, 1922. From Meyerhold on Theatre, translated and introduced by Edward Braun, London, 1969; rev. ed., 1998. Ya. 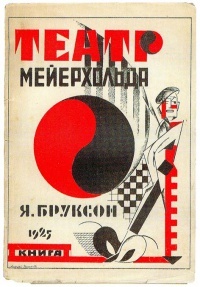 Brukson, Teatr Meyerkholda, 1925. Cover by Aleksei Ushin.